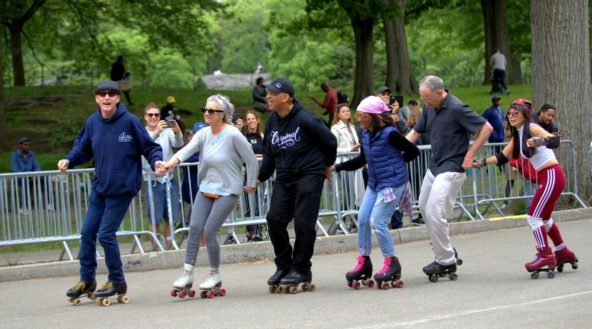 In 1994, the Dinkins administration reached out to to the Skaters on the Dead Road in Central Park. The area at the North end of the road had just been repaved as part of the Bethesda Fountain and Bandshell restoration. More and more, sponsored corporate events, fundraising walks and races benefiting various good causes, wanted to locate their events in Central Park. Problems arose when event contractors came into the park and filled the road with tents, bleachers and other gear for their events. The skaters were used to having this part of the park for themselves and were not happy to lose their favorite skating spot. They did not make it easy for the contractors to work. At around the same time, maps produced by the Central Park Conservancy and the Parks Department appeared in the park showing volleyball Courts filling the South End of the road, right down to the path between the Bandshell and Mineral Springs. The idea of volleyball replacing skating spurred us to start a petition campaign demanding a voice in the way that the area would be used in the future.